Fulton Schools of Engineering Convocation is a high-spirited event to celebrate graduating engineering students! Students, faculty and staff are encouraged to attend and cheer for the class of 2015. Can’t make it to the ceremonies in person? University Commencement represents the culmination of a student’s academic achievement. It is a time of celebration and reflection for students, families, friends, faculty and staff. It brings together a diverse community to share in the joy of accomplished goals. 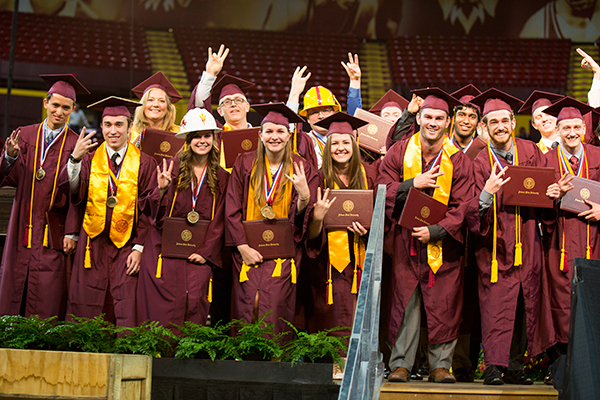 Graduates from all of ASU’s campuses are invited to participate in the commencement ceremony.